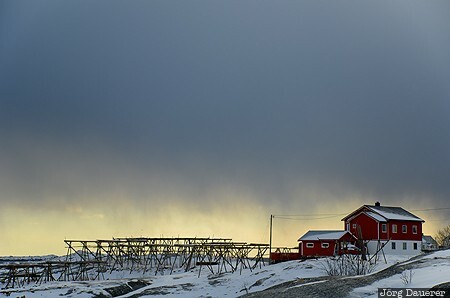 Snow and two red Rorbuer huts back-lit by the low afternoon sun below dark clouds in Tind i Lofoten. Tind i Lofoten is on the island Moskenesøy. The island Moskenesøy is part of the Lofoten archipelago, Nordland, Norway. This photo was taken in the afternoon of a sunny day in March of 2013. This photo was taken with a digital camera.